Kantar Worldpanel China reports 10% value growth for the FMCG (Fast Moving Consumer Goods) market for the latest quarter up to September 7th 2012 compared to the same period a year ago. This figure has slowed over the last quarter and coincides with continued slowdown in China’s economy to 7.4% in the latest quarter, the slowest growth of the last 14 quarters. The lower rate of inflation, just 1.9% in September, has been a key driver of this slowdown in FMCG value growth but shoppers have also made fewer trips to FMCG retailers whilst maintaining their basket size. This shows signs that households may be starting to look at ways of managing their spending. Across the 3 major departments within FMCG, household and personal care are seeing stronger growth of 12% in the latest quarter whilst food and drink lags slightly behind at 9%. The growth of premium products and high levels of media spending are helping to contribute to the growth of many household and personal care brands but these departments are also seeing the slowdown in value growth over the last quarter. The two leading retail groups, the Sun Art Retail Group and Walmart, have both seen declining share in the last quarter with Walmart seeing the most significant drop. Walmart’s decline can be seen across all city tiers with the largest fall seen in the 4 key cities (Shanghai, Beijing, Chengdu and Guangzhou) where the competition from both international and local retailers is most intense. Walmart’s weaker performance is driven by less shoppers visiting the store rather than shoppers spending less in the retailer. Given Walmart has slowed down its new store opening during 2012 the retailer will need to work harder to reinforce its everyday low pricing message in order to bring back or attract new shoppers to the store. Yonghui continues to grow on an annual basis through its expansion into new provinces allowing the retailer to reach more Chinese households. Yonghui’s growth has been most impressive in the Beijing where 28% households have now visited the store over the last 52 weeks. Prior to September 2011 Yonghui has virtually no presence in Beijing. Over the latest quarter, however, the retailer shows stable performance versus the previous quarter on a national basis following 5 consecutive quarters of share growth. The strong growth of e-commerce continues as this channel reports 52% growth over the last quarter. 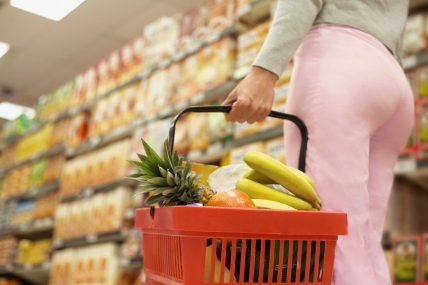 23% of Chinese households now buy their grocery products on-line and Kantar Worldpanel estimates that this figure will increase to 30% by the end of 2013 if the current trend continues. E-commerce remains more popular in the key cities when 36% of households have used this channel 5 times on average over the last year. In Tier 5 cities (counties) penetration is lower at 17% as too is frequency but the growth is strong as more households gain internet access and internet suppliers widen their distribution networks. Personal care items account for 57% of all e-commerce sales compared to just 18% in hypermarkets showing that these types of products dominate this channel. Also shoppers will spend much more per trip when shopping online with the average personal care trip costing 125 RMB compared to 36 RMB in hypermarkets but the number of items per trip is less. Therefore, shoppers purchase more premium products on-line where the availability is much higher. Household items, such as laundry powder and household cleaner, still represent a low proportion of on-line sales but this group of categories is growing at 100% within e-commerce showing that this channel is diversifying and on-line shopper baskets may start to look more like traditional baskets in the future compared to the current behaviour where many shoppers simply cherry pick one or two items. Currently the average number of items per trip in an e-commerce basket is 3.9 and this is increasing steadily overtime. However, there is still some way to go match the basket size seen within hypermarket of 8 items.